Abandoned online shopping carts are a perpetual thorn in the side of eCommerce: out of every 100 customers, 67 will abandon their cart. 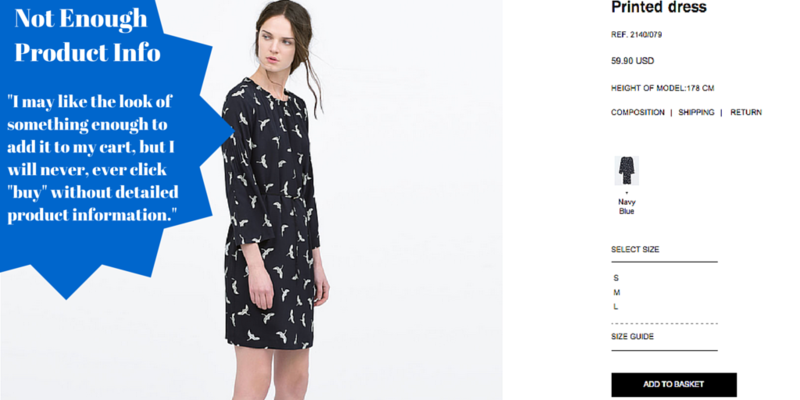 Expensive shipping is the number one reason I abandon my shopping cart. There's something unsavory about paying extra money on top of the item's cost just to have it delivered to my house. This is especially true when I'm purchasing an item I could buy at a brick and mortar store with little to no effort, or if I'm buying something cheap or on sale. Even if the item is expensive and the shipping cost is minimal, I will do everything in my power to buy the same product from an alternate retailer that does offer free shipping. If that's not an option, I will try to find a comparable item sold by a different brand that qualifies for free shipping. Basically, the only way I'm paying for shipping is if it's for an “I can't live without it” item that I can't find anywhere else. I never buy something online without doing a price comparison first to ensure that I've found the cheapest option. It always confuses me when eCommerce sites sell a brand's products at an inflated price because, Google. Keep in mind, I'm not talking supply and demand here -if a product is sold out or unavailable, that's one thing, but I'm talking eCommerce sites that consistently mark up products that are available all over. This may have worked back in the old days when shoppers couldn't do a price comparison at the push of a button, but those days are over. I will consciously avoid retailers if I know they sell the same products as their competitors at a higher price. I categorically refuse to buy a product online if I can't get a good sense of what the product will be like when it shows up on my doorstep. I hate dealing with returns, so I require detailed product information to make sure I'm getting exactly what I want. When it comes to apparel, footwear, and accessories I won't purchase any item that doesn't have at least 3 product images. For any other type of product, I depend wholeheartedly on product reviews. I also deeply appreciate product descriptions that go beyond simply telling me what a product is and instead explain why it's awesome. I may like the look of something enough to add it to my cart, but I will never ever press “buy” without detailed product information. 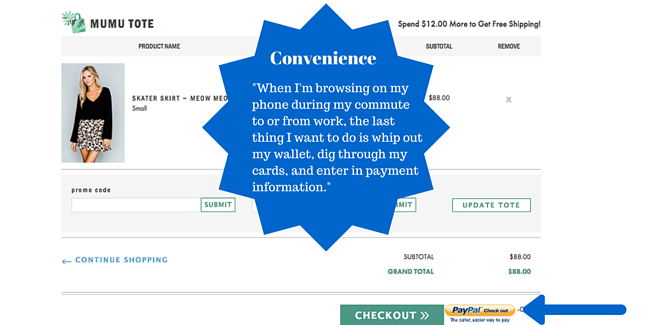 When I'm browsing on my phone during my commute to or from work, the last thing I want to do is whip out my wallet, dig through my cards, and enter in payment information. A lengthy online check out will make me abandon my cart faster than you can say “security code” and it's unlikely I'll even remember what I was shopping for an hour to two later. That's why I tend to favor retailers that keep my payment information on file, however it's only when I see my old familiar friend the “check out with Paypal” button that I feel at peace. I'm more inclined to purchase from sites that have a “check out with Paypal” option for two reasons: the first is that it allows me use any of my debit or credit cards, and the second is that it means one less retailer has my proprietary information which makes me feel more secure, especially if I'm shopping on a new site for the first time. I frequently abandon my online shopping cart it's because I have already exhausted my available funds for frivolous purchases. Until retailers start accepting Monopoly money, I can only spend so much of each paycheck. 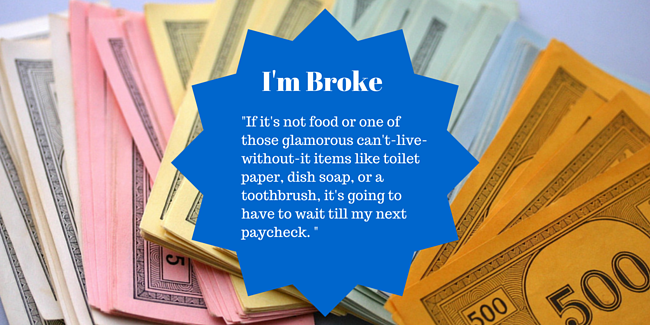 It's important to remember that the frequency and timing of an individual's paycheck can vary drastically. I get paid once a month, so at a certain point, if it's not food or one of those glamorous can't-live-without-it items like toilet paper, dish soap, or a toothbrush, it's going to have to wait till my next paycheck. As a consumer, I'd like all eCommerce sites to have free shipping with no minimum, but as a former eCommerce buyer I know that's not always a viable option. On the other hand, it's pretty easy to figure out the minimum amount consumers need to spend on your site to offer them free shipping, and it's also a great way to upsell. Just remember, unless your site exclusively sells items, offering free shipping for orders of 75+ can come off as self-serving. Allowing your customers to create a wish list is an easy way to minimize cart abandonment caused by those who are waiting for their paycheck. 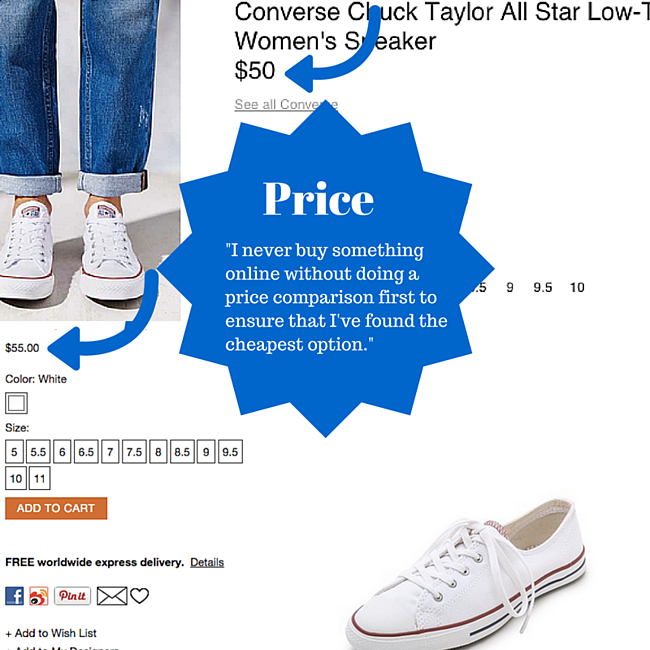 However, simply creating a wishlist feature won't do much for your conversion: offer consumers an incentive to use it. My recommendation would be a recurring monthly giveaway in which one lucky shopper gets one free item from their wish list. The cost of time and money is minimal, and requiring shoppers to include their information means you can add another name to your email list for easy retargeting. The infrastructure most brands and retailers use to exchange product information wasn't created to handle the high volume of product information that's needed for eCommerce. Manual data entry is a drain on time and employee moral and often leads to inconsistencies and mistakes. Look for a system of product information exchange with a central data repository that offers visibility and access to your entire team, which makes it easy to continuously add and improve product information. The number one rule of eCommerce is that it should be easy. Don't ask shoppers to go jump through hoops just to check out: make it simple. I highly recommend Paypal, but at the very least, offer a "quick checkout" option that allows requires the bare minimum of personal information.